Home » Craft Supplies » Beads & Stones » Glass beads » Czech beads » Fine Czech round 8mm beads. Notify me of updates to Fine Czech round 8mm beads. Fine Czech round 8mm beads. 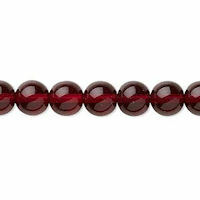 These fine 8mm (.3 inch) round, garnet colored glass Czech beads are clear and evenly colored. These beads look great as accents or as base beads in necklaces, earrings and bracelets. Czech beads are considered among the best beads in the world. Sold in 16" (40.6 cm) strands. Sold in blocks of 3 strands.